Relying on Moxie to keep himself afloat, Rusty Mazik finds opportunity in adversity. Re-opening his bakery in time for the king cake and Mardi Gras season in New Orleans, Rusty hopes to save his business. Rusty Mazik’s bakery business was dealt a devastating blow by hurricane Katrina, and his customer base disappeared overnight. Not willing to pin his hopes on government relief or litigation against insurance underwriters, he’s relying instead on his own wits and adopting a can-do survivor’s spirit to keep himself afloat -- and in so doing, helping to restore a mercantile heartbeat to the city of New Orleans. 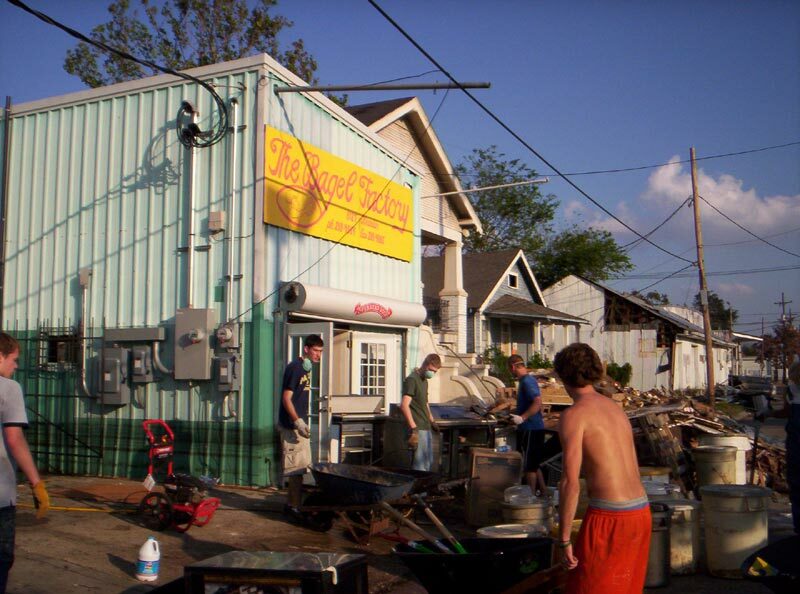 Pre-Katrina, Mazik, 46, presided over a thriving business with annual revenues of approximately $400,000. The Bagel Factory supplied gourmet baked goods, primarily bread and bagels, to posh hotels and other businesses catering to the city's booming convention and meetings trade. When he was finally able to get back into New Orleans to inspect his Mid City facility a month after the storm, he was greeted by a chaotic scene that almost defied comprehension. Doors ripped off the hinges. Trash everywhere. Machinery toppled. Cash register smashed into pieces on the floor. Soda machine busted open and robbed of coins. Alas, Mazik, married with two children, had more than just his livelihood to worry about. His home in Mandeville, on the north shore of Lake Pontchartrain, also took a hit. The storm had ripped off a section of the roof, and water poured in through the attic, laying waste to his kitchen. No matter that some of the actual damages sustained were due to vandalism, not flooding. “They were figuring the government was going to pay, so they weren’t going to. There’s no other way to explain it,” says Mazik. But where to find customers? With New Orleanians scattered far and wide and a rebound in the convention business still months away, Mazik had to improvise. Mazik’s King Cake Shop (http://www.kingcakeshop.com) offers both traditional and filled varieties. The cakes are made from hand-braided dough, rolled in cinnamon and topped with Mazik’s delicious butter-crème icing. Every package includes a limited-edition print, suitable for framing, entitled "Mardi Gras Everlasting" -- a tribute to Mardi Gras royalty by award-winning New Orleans artist Ray Cole; a set of four Mardi Gras greeting cards; Mardi Gras beads and doubloons; a special New Orleans-style blend of coffee and chicory; and a wonderful history of king cake and New Orleans Mardi Gras. Prices -- $32.92 for traditional, $39.95 for filled (apple, blueberry, cream cheese, lemon or pecan-praline) -- include overnight shipping via UPS. Ten percent of every online purchase will be donated to the American Red Cross. NOTE TO EDITORS: Photographs documenting Mazik’s ravaged Bagel Factory and the clean-up effort are available upon request. 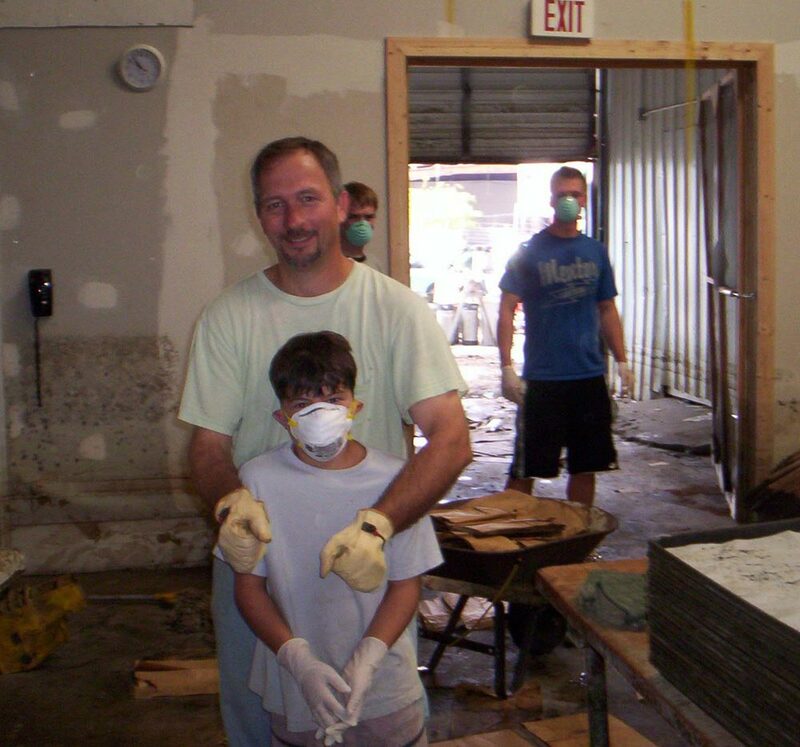 Clearing out the bakeryClearing out the mess left by Katrina Friends and Church Volunteers help clean upWith the help of community and friends we attempt to re-open the bakery. 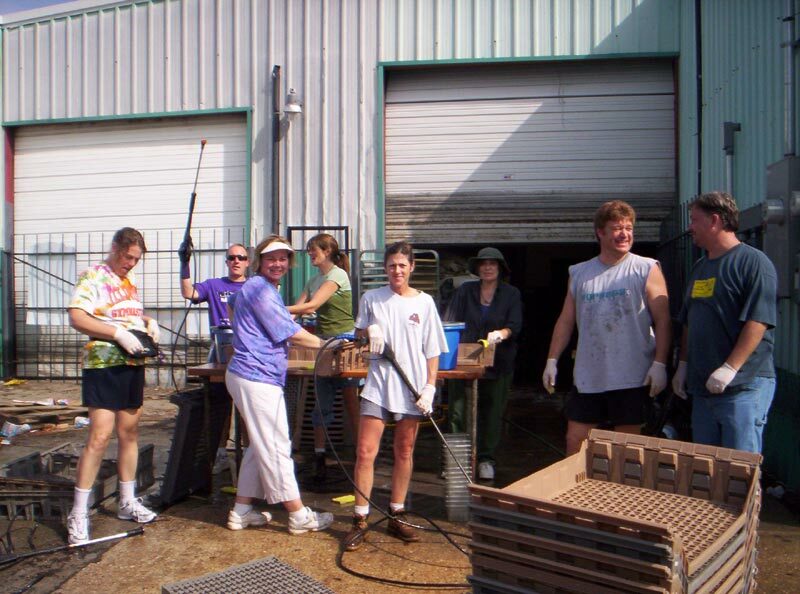 With the Help of Family and FriendsEveryone pitched in to clean up after Katrina's devastation. The Wonders of BleachEverythiing in the bakery needed to be scrubbed and bleached after Katrina. Didn't Smell LIke Fresh Baked King CakesMasks and gloves were needed to begin the post-Katrina clean-up.